A tall, determined man strode purposefully down the dusty farm road, half-hidden in a mysterious haze and smelling of sweat, smoke, and a peculiar mix of gasoline and diesel. As he approached, I watched in fascination as he repeatedly tilted a shiny metallic torch—literally dripping livid flames along the forest border. It was my husband. And he was setting our woods on fire! Thus began one of our most important—and meaningful—experiences in our homesteading and land-ownership endeavors. Fire, since time immemorial, a symbol of purification, power, and destruction, became our most powerful weapon, harnessed in order to protect, preserve, and enhance a small portion of this miraculous planet Earth that has been entrusted to us. While the smoky figure spewing flames might have, to others, appeared as a villain in the above scenario, he was actually the hero. But wait! Haven’t we been taught how dangerous fires in forests are? Indeed we have. Smokey Bear is America’s wildfire prevention icon. (And his name is actually Smokey Bear, not Smokey the Bear, I’ve learned. Go figure. ) According to his own website, he was created in 1944 and is “the longest running public service advertising campaign in U.S. history.” But you may have noticed a recent change in his famous slogan, which from 1947 was, “Remember… Only YOU Can Prevent Forest Fires!” Beginning in 2001, his slogan was altered to, “Only You Can Prevent Wildfires!” And the reason is clear: after many decades of fire suppression and the, perhaps unintentionally, implanted idea into the public psyche that was, basically, “Fire… BAAAAAAAD…”, we now once again realize what used to be common knowledge dating back to widespread Native American practices in land management. Namely, that there are “forest fires” and there are “fires for forests.” And in one of life’s many ironies, we clearly understand that fire, itself, is one of the best weapons against… well… fire! What started it all! My husband’s Prescribed Fire Certification, having taken his courses, passed his test, and executed a specific number of burns. I think the most shocking thing I learned in our burn experience was that we were 1 of only 17 states to offer burning certification! Hopefully, as we reacquaint ourselves all over the country with the ancient art of using fire to prevent wildfires, more states will offer more aid to homesteaders and landowners anxious to become good stewards through careful use of fire. Although we’ve done—excuse me, “executed”—several burns over the years, I will confess to a certain degree of consternation (that is, secret terror) this March while watching my husband deliberately setting fire to our beloved woods. It takes some gumption to do that, let me tell you. (I say gumption rather than “cajones” to avoid being unladylike.) After all, this piece of property is our biggest life investment, our future, the site of years of hard work and the realm of still-to-be-realized-dreams! A speeding truck barrels down our rural road with an open window, out of which flies a still-lit cigarette (a common occurrence, I’m afraid), which lands gently on a pile of dried leaves and brush at the base of an old, half-dead pine tree. With the same light, steady wind that was now actually helping our controlled flames rush safely to meet a carefully initiated backfire, I knew that that the small cigarette fire, without having been witnessed and quickly put out, would spread into other dry piles as well as creeping right up the side of that old tree—creating a gigantic torch that would, within hours, have been the means of destroying the woods we were now endeavoring to protect and nourish. Sixty “burned” acres later (achieved in both time and parcel increments), I realized that I was in a unique position to share an experience that many other homesteaders will participate in during their own land management endeavors. I know this because, according to research from a nationwide survey a few years ago, well over 20,000,000 acres will be prescribed burned nationwide this year; and since 86% of states in that previous survey reported burning activity as either “stable” or “trending up” from that number, it is inevitable that as landowners become educated about the benefits and even necessity of such burns—or should I say “reacquainted” with it—they will, like me, be recording their own success stories as they strive to keep their land in optimal health and productivity. In order to further encourage homesteaders and landowners, I wanted to share a few of our personal experiences along with some facts and strategies about the prescribed burning experience. 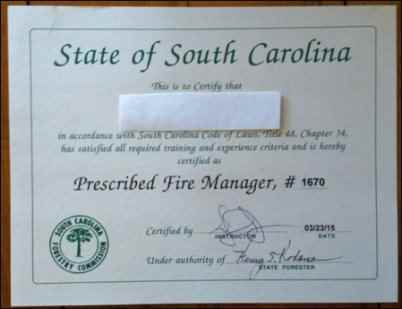 Well, because my state of South Carolina is only one of seventeen states that offers prescribed burning management courses and certification (shocking, no? ), and because our state prescribe burns between 500,000 and 1,000,000 acres per year (joining the southeastern and western region of the country in hosting around 98% of national prescribed fire activity), I wasn’t surprised at how well-equipped we were to conduct the burn, especially after official certification—which in our state’s case meant the completion of the management course and having conducted a specific number of burns. Our state’s extension agency and the amazing services and materials they offer; the plethora of resources available through the Prescribed Fire Council, the Southern Fire Exchange, and the Joint Fire Science Program; the fact that forestry and agriculture concerns in our state are well-used to prescribed burn practices… all this served to alleviate my fears about burning in general. Even if your state doesn’t offer burn certification, see what resources are available to you about the process. If a neighboring state has great resources, don’t hesitate to make use of them as well. One of the best things we’ve ever learned as aspiring good stewards of land is that there are so many people not just willing, but anxious, to help landowners in their stewardship endeavors. As mentioned above, “calling in the burn” has always been of particular help from a peace-of-mind standpoint and these burns were no exception. 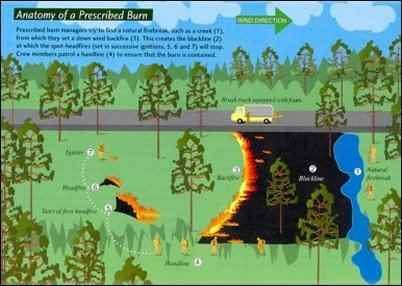 Here in SC, when you call in a burn, giving your latitude, longitude and other parcel location information and describe the type of burn you are desirous of conducting, along with an estimate of fuel and smoke tonnage (obtained through an easy formula you learn in the course) as well as providing the nearest highways that may be affected by your smoke, the state official on the line either gives you a permit number or instructs you that it is not recommended to do a burn at that time. If weather conditions are not right or there are other inhibiting factors, there will be an overall alert warning for burning in general, or they will instruct the caller not to conduct one at that time. If they give you the thumbs up you know you are not second-guessing yourself. You also have the satisfaction of knowing that the nearby fire-fighting facilities will be alerted to your burn; so they won’t be rushing in thinking it’s an emergency, but they will be available in case of an emergency! The timing and conditions were also exactly right for our burn, so that was another element leading to our confidence. It was too early for nesting and baby animal season. The area was dry enough to burn and yet it was not too dry. The humidity was low, but not too low, and the wind was perfect for directing the fire where we wanted it and yet the smoke wasn’t going to be a big issue for our neighbors and nearby roads. We had the parcels prepared for the burns and all the equipment we needed at the ready both for the management of the burn and for emergencies. And, finally, we also knew from much research that many of our initial concerns about burning in general fell into the “common misconceptions” category of the reality of burns. See the FAQs and frequent misconceptions and reassurances about burning section below. As for the burns, themselves, I must say the experience was both exhilarating and exhausting—exhausting in a good way! Since we had “started small” and experienced fire on less challenging and smaller levels, it wasn’t nearly as nerve-wracking as I anticipated. But I must emphasize that the most important factor here, besides education, training, and practice, was PREPARATION. This is something you can plan for years in advance or you can achieve within a relatively short amount of time. 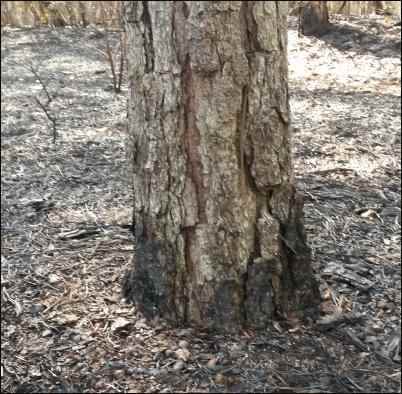 If you investigate the resources I provide in this article, you’ll see much about the logistics of a burn, including fire-lines and other boundaries that create a safe and effective burn environment. But for a super-condensed version, we had divided up our property over the years into parcels that were divided by either natural or manmade defined boundaries referred to as fire lines. These boundaries ensured that fire from one part of land didn’t jump, creep, or flow onto another. Taking advantages of natural barriers, like our pond (muddy this day, thanks to a neighbor’s runoff), is a great way to divide up your parcels for burning. 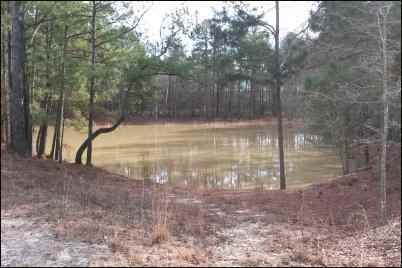 At the time of this picture, the portion of the woods to the back of the pond were already burned and the portions to the left and right were set to burn on different days. Beyond the woods behind the pond is a county maintained dirt road—an excellent burn barrier, but at the same time, a place you want to ensure does not experience too much smoke! So wind direction was crucial. In our case it was ideally easy because we had the benefit of numerous old logging roads throughout the property, a river being one overall boundary, a large creek being another boundary, and a county-maintained dirt road being another, and the added benefit of several small bogs and rivulets serving as mini-breaks throughout the overall parcel. I had the reassurance that, in the very worst case scenario, it would be almost impossible for a fire that somehow got out of control to endanger other portions of the farm, much less anyone else’s property. And as you see from the misconceptions section of this article, statistically, the odds were in our favor. 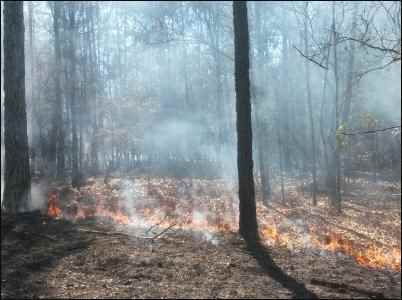 It’s usually somewhere around 0.0-something-or-other % of controlled burns on record that turn into wildfires! (Please see statistics below.) So even if you don’t have the ideal conditions on your land like we had, be reassured that you can create what you need as well as working with what you already have on your property to ensure a successful burn, yourself. Note the low, creeping flames of our mixed woods burn above versus the out-of-control flames and smoke of the real wildfire in the below image. A closer view of the “backing” fire in one of our parcels, marching quickly but safely to meet the “header” fires. The backing fire is started along a fire line or other boundary and is on the downwind edge of the burn area. It “backs” into the wind. 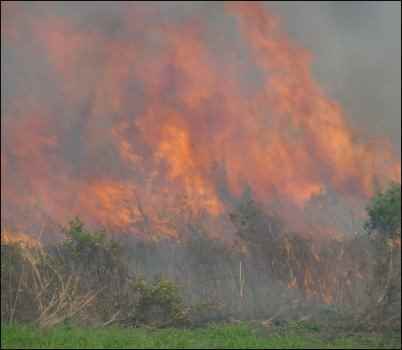 It is usually referred to as the safest kind of fire to use in a controlled burn because it burns slowly. But it needs a moderate wind that is consistently blowing in one direction to safely succeed. It also requires low relative humidity (because damp stuff doesn’t burn!) and it needs enough dead fuel on the ground to “carry the burn.” If there’s more dirt or sand on the ground than debris your efforts will be useless. A backing fire used in tandem with “heading” fires (also called “stripping” or “header” fires) can result in a much faster burn. The heading fires require safe timing and distance between the fires. They are set up in lines upwind from the backing fires and they should be perpendicular to the wind (see illustration above). In a burn like ours, you set the back fire first on a parcel, allowing it to burn enough material to create a safe zone behind it. The header fires are set in a series (or a strip) and since they are usually far apart (say 20-50 feet), you can ensure safety while working with the specific conditions of your weather and your burn. You don’t want these fires to get too hot (I am supposed to say “robust”) before they run into a firebreak or fire line or other boundary. I watched with fascination as fire traveled so quickly over the ground that it actually left a great deal unburned. Overturned trees and logs, mossy mounds and other elements of the mixed hardwoods didn’t get charred at all, while dead wood, fallen debris and choking vines flamed right up… and yet the fire never crept too far upwards—you can see from the picture below how little of the tree trunks actually showed any traces of the fire afterwards.